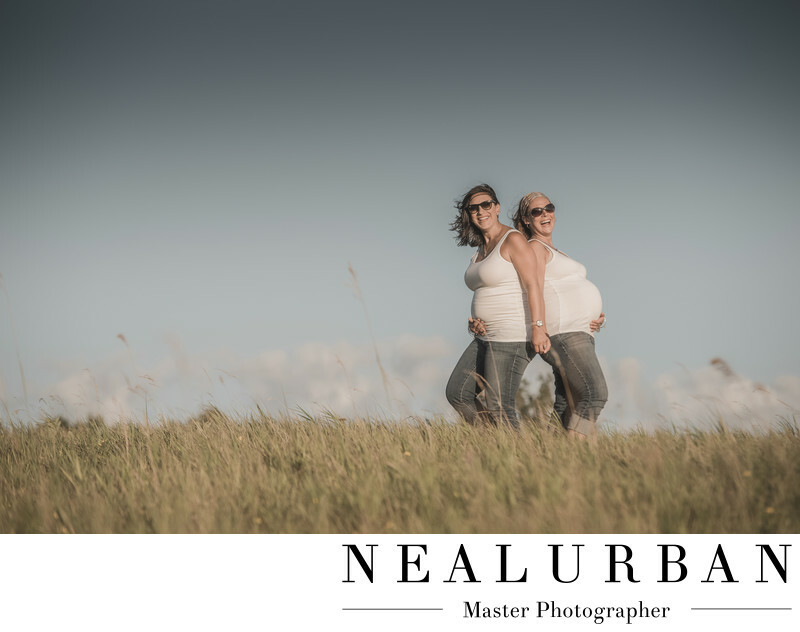 Double maternity session at Tift Nature Preserve in Buffalo, NY. When Natalie and Joe contacted us to say they were expecting and wanted maternity photos, we were so excited. We had already photographed their wedding at Pearl at the Webb Hotel in downtown Buffalo. There would be a twist to the shoot though. Natalie asked if her sister (Nellie), who was also pregnant, to be in some of the photos. We thought it was a great idea! We knew her sister pretty well from the wedding. Natalie also did a boudoir session with us and her sister accompanied her! You could say we all had history together. We knew their personalities and that it was going to be fun! They are both so outgoing. They wore matching outfits too! Natalie and Nellie wanted super casual and fun photos. We had them go up one of the rolling hills at Tift for this image. The sun was lighting up the tall grass and making it a golden color. We also loved the clouds in the back ground. We had them stand back to back so both baby bumps would show. Then we asked them to hold hands. We have no idea what they were talking about, but they both started to laugh. Their expression were so amazing and we could not have been happier with this. This image is so natural and shows Natalie and Nellie's true personalities! Location: 1200 Furhmann Blvd. Buffalo NY 14203 United States.